A pair of University of Notre Dame students received awards in the 24th annual Student Design Competition sponsored by the International Housewares Association (IHA). The students will have their entries showcased at the International Home + Housewares Show from March 18 to 22 in Chicago. Senior Dan Lopes of Laguna Niguel, California, received a third-place award, and senior Erin Rice of Lincolnshire, Illinois, received honorable mention. The Student Design Competition’s annual challenge is to redesign a current housewares product to meet the needs of the future, or to create a concept for a new product. Winning projects are selected for their innovation, understanding of production and marketing principles, and quality of entry materials. Lopes and Rice created their projects under the direction of Scott Shim, a professor of industrial design in Notre Dame’s Department of Art, Art History & Design, as part of his “Design Thinking” course. Lopes’ project is called “Scoop Pet Food Dispenser.” It was designed to make feeding our dogs a more enjoyable process. 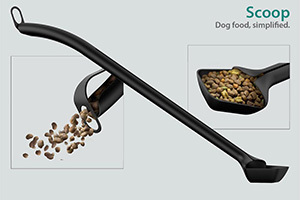 Its flexible spout and funnel features enable users to scoop their dog’s food out of its bag and dispense the food into dog bowls at a comfortable standing position. After gathering a scoop of food, users turn “Scoop” upside down to funnel the food into its hollow handle. The food is held in place by the flexible spout cover, so with a slight push against the surface of a dog food bowl, the cover bends and allows the food to pour cleanly into the bowl. When done feeding, a slit that runs along the handle of Scoop allows it to nest on the top of the rolled-up bag, doubling as a clip to keep the food fresh and spill-proof. “Dan’s design is very thoughtful in that it solves problems at multiple phases of feeding the pet: preparation, transportation and maintenance,” Shim said. 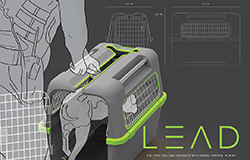 Rice’s project is called “Lead Animal Control Cage.” It is an assistive dog crate that aids animal control officers in safely and efficiently taking dogs off the street and transporting them to the nearest animal shelter. Current lack of lift-assistive equipment relegates animal control officers to using animal control sticks to carry potentially dangerous or sick stray dogs into transportation vehicles. To avoid this, the crate is designed with a long hole on the top to allow an animal control officer to walk a dog through the door, close the crate and release the control stick once the dog is inside. The officer then has plenty of time to use the various ergonomic grips and the assistive bottom knee inset to lift the crate and the dog safely inside an animal control vehicle. The crate easily separates for easy cleaning and stackable storage capabilities. This is the 24th year design students have been honored at the International Home + Housewares Show, expanding awareness of careers in industrial design among students and highlighting the impact of design on the $314.3 billion global housewares industry. Since the competition began in 1993, approximately 5,000 college students have entered, and each has come away with an educational experience that the design profession recognizes as unique. “My students took advantage of their knowledge in ‘Design Thinking’ and were able to execute their project with a human centered approach,” Shim said. “Through a non-linear qualitative process, they framed relevant pain-points and provided contextual solutions that are quite innovative. Originally published by William G. Gilroy at news.nd.edu on February 13, 2017.